The 3rd Secret:To Get Over Sadness You Must Feel Sad. What the %&#? I’m sitting on my deck reading Panache Desai’s new book “Discovering Your Soul’s Signature (which you should definitely check out because it’s chock full of examples for young people. It’s really not another secret adults are keeping from you though I doubt anyone will recommend it to you so it will seem like a secret but I digress…) Anyway, where was I? Oh yes, the book. What the &*%? It seems silly right? It actually almost seems ridiculous! How can being vulnerable (or weak) make you powerful? How does being sad make you human? The thing is, it’s actually not silly at all. It’s sort of this universally accepted truth that feeling all of these things makes you the most YOU. Your truest self. Not your little voice. Not your ego. That’s not you. When you are open and honest and raw and vulnerable. That’s when you are YOU. It’s a big secret being kept from you. In fact, it’s actually the third secret. Secret #3: To be your True Self, you must sit with and be open to emotions you actually try to and are trained to avoid. Then I realized how utterly and completely silly that must seem to you at your age. It’s actually not that easy of a concept for lots of adults but the teenage years are especially tough to be open and vulnerable and honest and raw. There are so many expectations placed upon you. You are expected to be so many things to so many people and there are so many outlets (like Insta, Tumblr, Twitter, SnapChat) in which to portray yourself. There are also so many things to compare yourself to like actors and actresses and reality TV stars and models and pop stars etc. You’re expected to be smart, thin, popular, talented, always happy, perfectly dressed and have perfect skin. Oh and rich would help too. Honestly, my heart just breaks for you because I struggle with this now and I remember what it was like when I was your age. You’re probably thinking that if you were actually honest, open and vulnerable that you’d be ridiculed, mocked and reviled. Well, given that most of your peers are listening to their little voices/egos 99% of the time, you’d probably be right. But the truth is, you need to take the chance of being all those things and feeling all the scary emotions. You need to feel sad. You need to feel fear. You need to feel anger. You need to feel disappointment. You need to feel grief. You need to feel hurt. The fact that there are new books coming out every day for adults with the same information (in fact, this is all pretty ancient stuff) tells you that we still haven’t gotten this right but you have a chance to be different. You have a chance to learn this stuff now! You can learn to silence your little voice. To not let your ego rule your world. To sit with these emotions. To be your True Self. So trust me on this one. 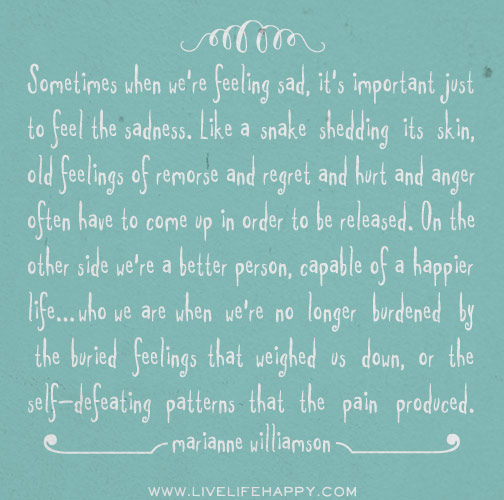 To get over your sadness you must feel sad. To get over anger you must feel anger. To get over disappointment you must feel disappointment. Let it wash over you. Sit with it. Feel it. Own it. “Feel the swells [of emotion] rising and falling inside of you” as Panache Desai says. Don’t be afraid of these waves. Don’t thrash about in them. Just go along for the ride. Feel all of it and become more human. Feel all of it and become your True Self.